their location. We can help you achive all this with yeastar mypbx Ip phone system. Yeastar specializes in the developing and manufacturing of IP-PBX / VOIP PBX , VoIP gateways, and IP video surveillance products and is committed to the distribution of new generation technology products in the field of enterprise communications. In the mean time, Yeastar provides the cost-efficient solutions for ITSP to develop the enterprises ultimate purchase market. 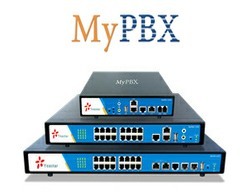 MyPBX U500 is intended for offices of up to 500 users, offering 16 phone ports for FXO, FXS, GSM, UMTS, ISDN BRI connectivity. It supports up to 80 concurrent calls. The connection to traditional network allows company to protect their previous investment while taking advantage of cost savings and the full complement of VoIP features and being able to nimbly respond to growth and updates. MyPBX U510 is equipped itself with an embedded E1/T1/J1 port and 16 phone ports which enable the various combinations of FXO, FXS, GSM, UMTS, ISDN BRI ports. It supports up to 80 concurrent calls. Perfectly suitable for businesses of 500 users, U510 couples VoIP with traditional telephone lines offered scalability, cost saving, and simplified support and maintenance. MyPBX U520 is an enterprise-grade solution designed for offices of up to 500 users, supporting up to 80 concurrent calls. It boasts to have 2 embedded PRI (E1/T1/J1) ports and 16 phone ports for PSTN, ISDN BRI and GSM/UMTS connectivity. Thus U520 couples VoIP with traditional telephone lines offering scalability, high availability, cost saving, and simplified support and maintenance. Modules are optional accessory in yeastar mypbx IP Pbx for PSTN line,GSM Sim card and BRI Line except E1/PRI. E1/PRI is inbuilt in U300,U510 AND U520.